Posted: Thursday, June 30, 2011 12:00 am Updated: 6:18 am, Thu Jun 30, 2011. The Legislature failed to pass a bill Wednesday that would have loosened restrictions on New Jersey’s wine market and possibly end a long legal battle before legislators recess for the summer. The law, which would allow wineries to ship their products directly to consumers and allow out-of-state wineries to open retail outlets here, passed the Senate and went back to the Assembly, but was not put to a vote by the time the chamber ended its session late Wednesday night. That leaves the state with laws governing wine sales that were deemed unconstitutional in December, and which wineries are anxious to get changed before a U.S. District Court judge takes action on the matter. It also leaves 15 wineries unable to get licenses, since the state Division of Alcoholic Beverage Control will not issue new licenses until the state’s legal battle brought on by residents and out-of-state wine producers is settled. “We’re sitting here with about 10,000 bottles of wine that we can’t sell,” said Art Reale, co-owner of Jessie Creek Winery in Cape May Court House, which is desperately awaiting a license after investing millions of dollars in an inn and vineyard. The bill, sponsored by Assembly Majority Leader Joseph Cryan, D-Union, passed the Assembly in March but languished in the Senate until a substantial amendment of it passed late Monday night. The law was made to exactly match that of another sponsored by Senate President Stephen Sweeney, D-Salem, Gloucester, Cumberland, adding an allowance for direct shipments and increasing the number of sales outlets that in-state and out-of-state wineries can open in New Jersey. It passed the Senate by a 25-10 vote, surviving a motion by Sen. Christopher “Kip” Bateman, R-Somerset, Morris, that would have sent it back to commitee. But the bill never made it to a vote in the Assembly, and it is unclear whether it would have anyway without further amendments. That’s because the direct shipment aspect, added by the Senate, has been the most controversial element of the legislation since it was introduced at the beginning of the year, and was excluded from the original Assembly bill. The powerful wholesale and retail liquor lobby has fought against it, saying it would result in lost warehouse and liquor-store jobs, and that the state has little ability to monitor whether wineries are paying taxes on shipments or checking whether recipients are of legal drinking age. Meanwhile, the growing New Jersey wine industry is anxiously awaiting the Legislature to expand the market here, fearing that the U.S. District Court in Newark may instead further restrict the state’s laws and effectively close most of the vineyards. 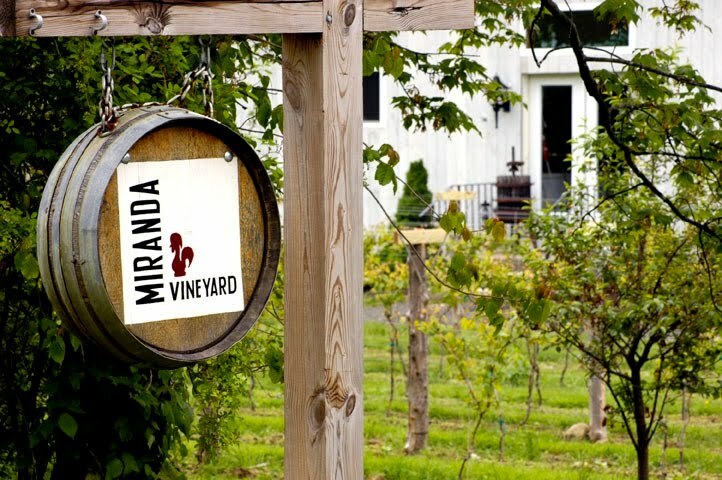 The court is considering a case handed down from the U.S. Court of Appeals for the Third Circuit that said New Jersey needs to equally allow in-state and out-of-state wineries to ship to customers and open retail sales outlets. Wine growers fear the judge could just as easily tighten the state’s laws, which would require all 39 New Jersey wineries to go through wholesale distributors — something most say they are too small to afford and would effectively put them out of business. The parties involved in the legal fight have been scheduled to meet throughout July and August. So far, the Garden State Wine Growers Association has been excluded from the case, and after having its motion to intervene denied last week, filed for a rehearing Monday. Coastal Wine Trail Today!!!! June 26th, 2011! I'M A LITTLE LATE HERE....BUT YOU GOTTA GO! What could be more pleasant than to spend a summer afternoon in a vineyard, sampling wine and delicious food? That's the prospect in store for Sunday at Sakonnet Vineyards in Little Compton, R.I. 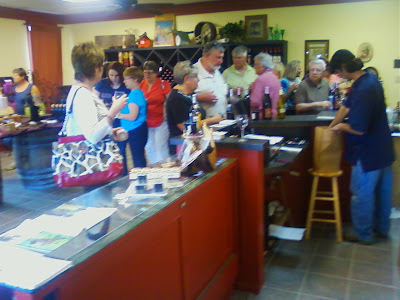 The occasion is the Coastal Wine Trail Festival, featuring its nine member wineries. Representing SouthCoast are Coastal Vineyards, Travessia Urban Winery, Running Brook and Westport Rivers Vineyard & Winery. While there, it would be fitting to raise a glass and toast the Russell family, which this year is celebrating the 25th anniversary of Westport Rivers winery. 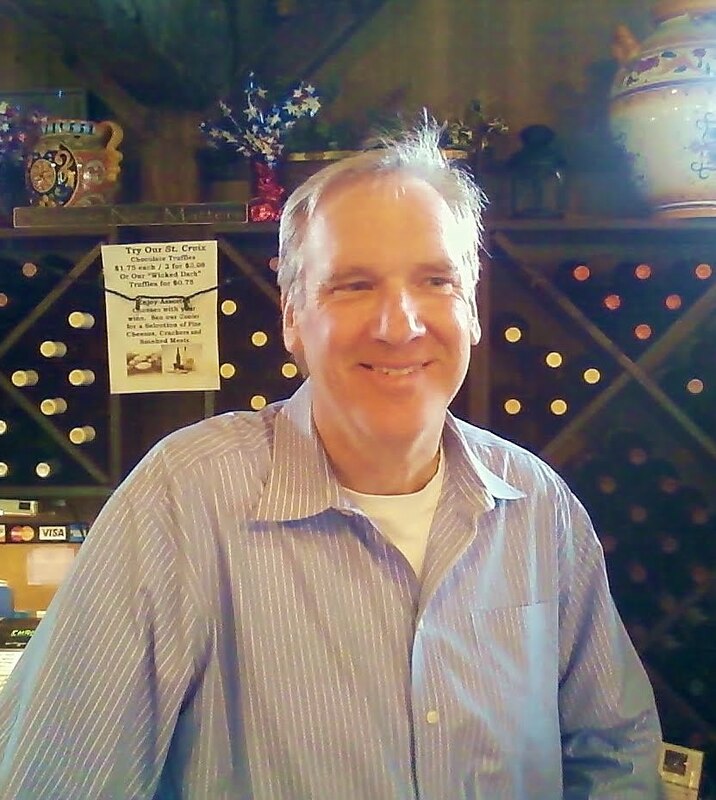 I caught up with winemaker Bill Russell by telephone Friday, and chatted with him about the wine trail, the spring season, and his winery's plans to celebrate. Though most of us moaned about the cool, wet weather in May, Russell said "it is kind of normal in a way." He said established plants, like their 80 acres of grape vines, react differently than the transplants we place in our gardens. Russell said it's still an uphill battle to convince wine lovers that Massachusetts wines are more than a novelty. "When I think back, it's not the natural climate that's been the challenge, it's our cultural climate," he said ruefully. Through the decades, Westport Rivers wines have won dozens of gold medals, acclaim in the press, placement on wine lists at stellar restaurants, and been served at the White House by two presidents. "They're exceptional, not just OK," said Russell. The winemaker said the Coastal Wine Trail and its passport program (coastalwinetrail.com) have been helpful to "those off the beaten path," like Westport Rivers. "We're all just a bunch of farmers who are working across state lines to promote what we're doing down here." 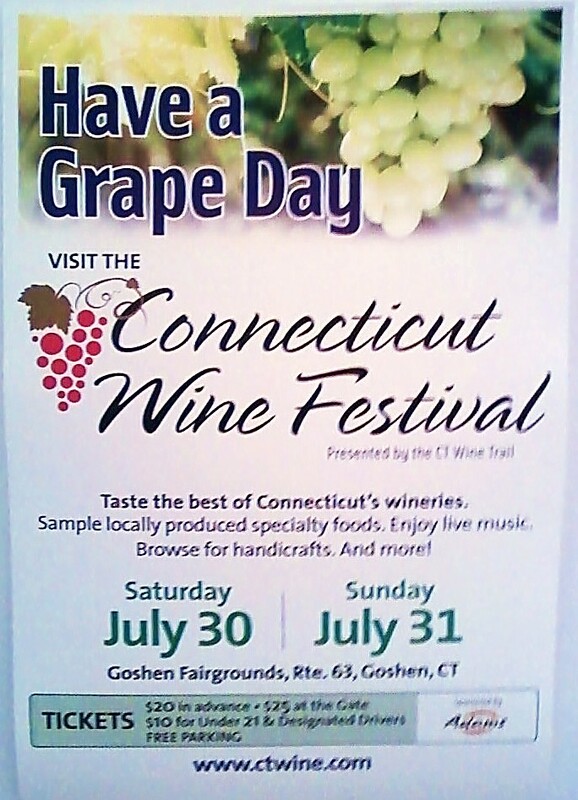 The New Hampshire Winery Association presents wine samplings from more than a 17 local wineries, plus live music from Beatle Juice and lots of locally made products. Tickets are $20 in advance and are unavailable the day of the event. Guests must be at least 21 years old. The NH Winery Association was founded in 2006 and currently has over 50 members representing 30 wineries across the state. Last year’s inaugural wine festival sold out in 3 weeks!!! This year’s event promises to go one step further with a larger venue, more local NH Made Vendors & world class live music by Northeast favorites, Beatle Juice!!! Over 17 wineries will take part in the festival, showcasing approximately over 100 wines covering a variety of flavors and styles including local grape wines, fruit wines & meads. Festival goers will get to sample wine as well as purchase bottles to enjoy at home. Spread throughout the venue will be a variety of NH businesses demonstrating, sampling, and selling their products; from baked goods to soy candles, bison meat to hot sauces and glass decorations. Live music will be provided by Beatle Juice, Boston & New England area favorites playing traditional Beatle covers. Members of Beatle Juice encompass a who’s who of Boston Rock Legends including members from The Fools, Farrenheit, & the Nervous Eaters. At Rochester Fairgrounds, 72 Lafayette St.
Wineries in the state can get a tax credit for part of the cost for new or upgraded equipment. A new law passed in this year's General Assembly session provides a corporate income tax credit for farm wineries. 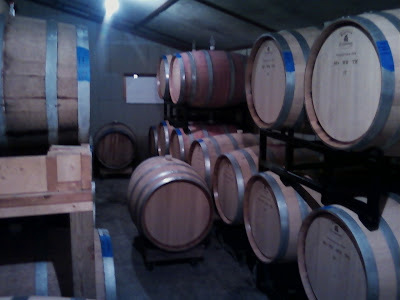 The tax credit, which is available starting in the current tax year, allows farm wineries and vineyards to get credit for up to 25 percent of the cost of certain equipment and materials--everything from barrels to fertilizer. The credit is capped at $250,000 a year. It's not a lot of money compared to the cost of setting up or expanding a vineyard, but winery owners say it's yet another example of Virginia's support for wine and wine tourism. Ann Heidig, of Lake Anna Winery and president of the Virginia Wineries Association, said it can cost up to $15,000 to put in just one new acre of vines. A credit for 25 percent of that isn't necessarily a lot. But, Heidig said, every bit helps in the current economy, when it's hard for small business owners to get loans. "Any help on the part of the government is really a value added to us and to the government," she said. 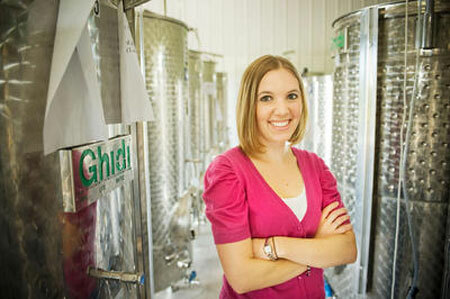 Heidig said helping wineries expand also helps create jobs, a benefit to the state. Carl Henrickson, of the Virginia Farm Wineries Council, is opening a new winery himself, Little Washington Winery in Rappahannock County. His estimate of the cost was about $10,000 per acre. No one's choice to become a wine-maker--which Henrickson called a lifestyle decision--will be made based on the tax credit alone, he said. "But the tax credit does in fact make it easier when tax time comes around," he said. He and Heidig both said Virginia's government has been very supportive of wineries and vineyards. The tax credit bill came from Gov. Bob McDonnell. 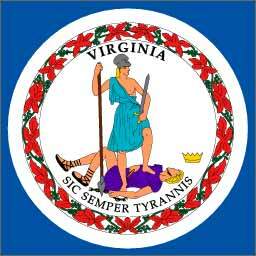 Henrickson compares Virginia's wine climate to that of Maryland. In Virginia, there are currently 197 wine tasting rooms, Henrickson said. Maryland, by contrast, only has about 40. That speaks to "the bigger picture of a friendly relationship as a whole" between wineries and the state, he said. "In Virginia they're doing everything they can to promote wineries," said Jim Livingston, of Hartwood Winery in Stafford. "It's unbelievable what they're trying to do for us." CUMBERLAND — Numerous Maryland laws and regulations regarding agriculture will go into effect the week of June 27. These laws define locally grown food, allow wine to be shipped in and out of state, transfer seafood marketing and aquaculture development to the Maryland Department of Natural Resources, and increase weights and measures registration fees. Regulations concerning the advertisement of “local” foods go into effect Monday. If advertising a food product as local, businesses must have point-of-sale signage indicating the state of origin of their product. These products include raw meat, eggs, fish, fruits, vegetables, shellfish and processed dairy products. • The Direct Wine Shipping law will allow wine to be shipped to Maryland resident from in- and out-of-state wineries. The wine must originate from a winery — not a retailer or auction house — and is limited to 18 shipments per year per household. • The transfer of seafood marketing and aquaculture development to DNR will streamline the development, oversight and permitting process for the aquaculture and seafood industries into one agency. • Weights and measures registration fees will be increased for scales with a capacity of up to 100 pounds and retail motor fuel dispenser meters of under 20 gallons per minute. Some of these measuring devices include deli counter scales and gasoline pumps. For more information, go to www.mda.state.md.us/pdf/buylocalfaq.pdf or call Mark Powell at 410-841-5770. 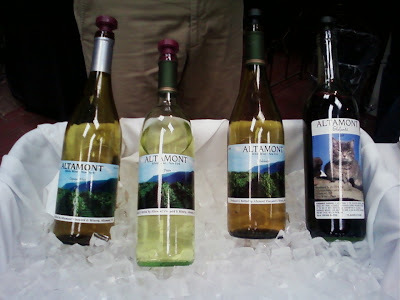 Altamont Vineyard can be found in the Upper Hudson Valley region. 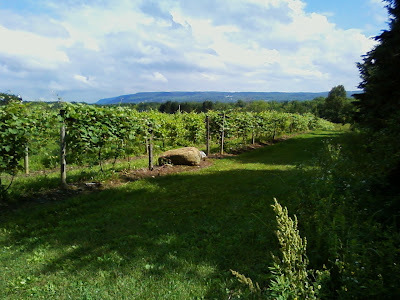 The Mohawk and Hudson Valleys of Upstate New York are being increasingly recognized as established wine regions within the United States and North America. At the intersection of these Valleys, Altamont Vineyard and Winery sits at the crest of the Helderberg mountains. Louis DiCrescenzo, toiled for his grandfather begining at the age of five, worked the vines in their family vineyard in Monte San Biagio, just south of Rome, founded Altamont. 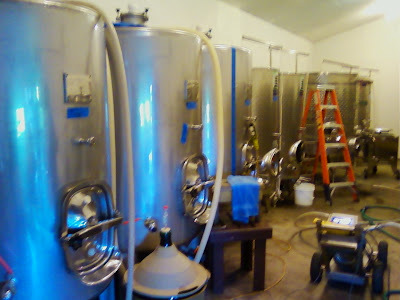 Louis, his son Michael, and Deborah Crawford, bring their best techniques of European winemaking to Altamont Vineyard and Winery. Michael and Louis showed me their place. They have an extensive vineyard, more than 12 acres planted to vines, with more than 20 varieties of grapes grown and harvested. They also buy in a few grapes as well. Michael explains that they grow a number of vines, but there's no question that they are spending a lot of time with Minnesota varieties, as well as those developed by Elmer Swenson, who really helped put Minnesota on the map when it came to grape breeding. I found several promising things. I think Minnesota is doing some wonderful things with their grape program. I can't review all the wines I tasted, so I'll point to the ones that made an impression on me. Harvested from a young award-winning vineyard in Lodi, NY, this wine is dry and crisp. Flavors of tangerine and grapefruit come through as promised. It's a light, bright, sophisticated refreshing dry white wine. Lovely. If you closed your eyes, you would have thought you were in the Finger Lakes. Very, very good! Deserves to be in any quality reisling conversation. This was more of a slightly off-dry light white, unsual, since many people prefer to make cayuga sweet. Lots of apple and lemon flavors, with high acidity and a quick finish. Aged in stainless steel. Another bright fresh white wine great to have with food. I'd never had St. Pepin before. An Elmer Swenson entry from 1970. Unlike most modern grapes it is a pistillate female and so needs to be planted next to male vines from a close sibling variety to achieve pollination. It's very much resembles its parent Seyval Blanc. We bought a lovely medium-bodied white. Grassy and floral aromas dominate, as promised, with crisp and refreshing mineral flavors. A very nice surprise. Especially good with food. 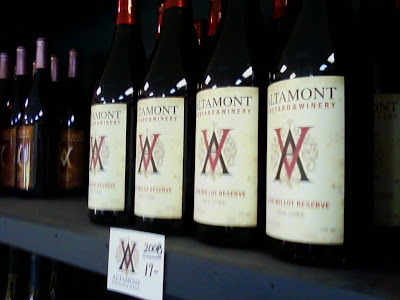 This is Altamont's flagship wine, and it would be a standout no matter what line-up it wa sold in. This Leon Millot is aged in French oak. A big, inky, deep purple wine, with great aromas and flavors. Very Burgundian in it's feel. Very much Rhone-ish in it's feel. Cherry predominates, with cassis and hints of dark raspberries. A slight whiff of vanilla and a hint of mocah or sadle leather. The acidity is not too high, and the tannin are nice but not overwhelming. Easily one of the better read wines of the Hudson Valley region. Altamont is one of the rising stars of the Hudson Valley Region. They are gaining a solid following and are producing good wines. They are certainly a star in the Upper Hudson Valley area. If you're looking for a nice tastingroom setting, and a solid list of wines, Altamont isn't only a good bet, it's a great treat. 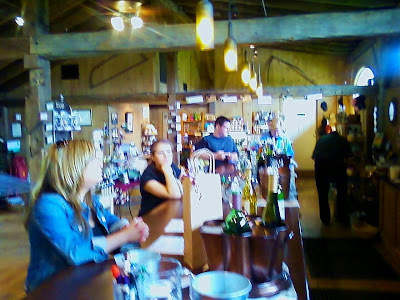 Jessica Harding is behind the counter, and greets you with the friendly smile, while "Bottle Shock" plays behind her on a hi-def television. Treat yourself, and go visit them! So last night we had company and I decided to pull another older wine. We had penne rigate with a creme pesto sauce, made fresh. I thought I'd like a medium-to-deeper red. So I decided on the Hopewell Valley Rosso della Valle 2005. This wine is a blend of Cabernet Sauvignon and Chambourcin. It's fermented in stainless steel and aged in bottle for 6 months. It was a deep burgundy color, a slightly opaque. Plum and cherry on the nose, with a hint of spice. Raisins, raspberries, and plums all come through as promised. The wine was delicious! It was incredibly drinkable and very smooth. Nice fruit, balanced acids and tannins, it tasted beautifully alone and even better with the food. A wonderful wine that aged very, very nicely! Like starting a business, creating a good wine is all about timing — selecting the fruit, monitoring the fermentation, aging in the appropriate barrel. Kathe and Bob Bartlett know a lot about wines, as their Gouldsboro company, Bartlett Maine Estate Winery, has won numerous awards over its 30-year history. But recently, market trends have finally aligned for them to pursue another passion: distilling fruit into the intensely flavored spirits, or eau-de-vie, they fell in love with while touring Europe in early ‘90s. Now tastes have changed. 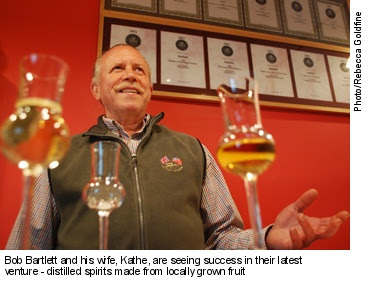 “Eau-de-vie has gotten more popular,” says Kathe, prompting the couple to form Spirits of Maine Distillery in 2007 and invest in the equipment to make the dry, aromatic spirit that for centuries has been used in Europe as a digestif following a meal. This spring, two of the Bartletts’ eaux-de-vie took honors at the 2011 San Francisco World Spirits Competition, which drew more than 1,000 entries from 61 countries. The Spirits of Maine pear eau-de-vie won a double gold and its apple brandy earned a silver medal. “We were very excited by the recognition,” says Kathe, noting the awards validate their many years spent perfecting techniques for fermenting fruit. Denise Gardner thinks about wine all day. Specifically, Pennsylvania wines — Catawba and Niagara made from grapes native to the state, Chardonnay and Merlot from French hybrids, Vidal Blanc from high-sugar white grapes. A sensory scientist, Gardner can swirl a splash in a goblet and assess it by examining the color, sniffing for off-odors and tasting for tannins. The 26-year-old wine expert, hired last month as Penn State Extension's only enologist, will work with the state's 140 wineries to enhance the quality of their products. "In the traditional sense, (enology) deals with wine analysis and quality control. We apply those practices to fix or tweak wine," Gardner said. "We want to help improve overall quality on a year-to-year basis." Winemaking is a fast-growing agricultural business in Pennsylvania, said Dennis Calvin, director of Penn State Extension. "That's really part of the reason behind the position and interest in the industry of having an enologist," he said. "People look at Pennsylvania wines. Some are very good, some not so good." After the state's first enologist left three years ago, "we committed to the wine industry to fill the position when we could," Calvin said. The state Winery Association and the Wine Marketing Research Board contribute funding for the position. Enologists study wines for inconsistencies and factors that detract from quality. Gardner said those factors can range from oxidation, when wines are overexposed to oxygen and take on a sherry-like quality, to cork taint, a musty smell and taste that seeps into the wine, to sulfur aromas and flavors that evoke rotten eggs or cabbage. 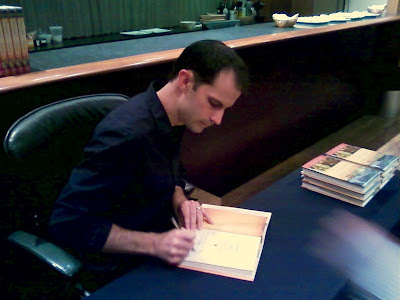 I first met David Whiting when I began writing my book EAST COAST WINERIES many years ago. He was just starting up Red Newt Cellars. He had left Standing Stone, where he had made me a fan, to start his new label. I was a fan then, and I am a fan now. Grapes are a paint brush in this artist's hand. I recently tasted the Red Newt Cellars Riesling - Sawmill Creek Vineyards 2009. This was a wonderful wine. It had a big nose with fresh green apple, with hints of lime and something more floral. The finish was incredible. It was a brilliant, light wine with a tremendous refreshing finish. It's no wonder James Molesworth rewarded this spectacular wine with a score of 90 points in Wine Spectator. 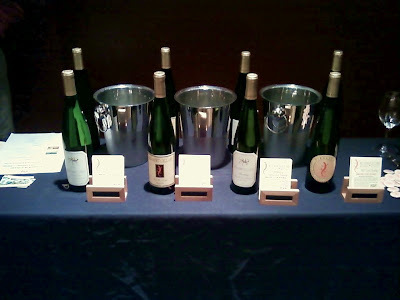 Oskar Bynke was on hand last week in New York City pouring his wines at Union Square Wines during a celebration of rieslings with two toher winemakers and a book signing by Evan Dawson the author of Summer in a Glass. 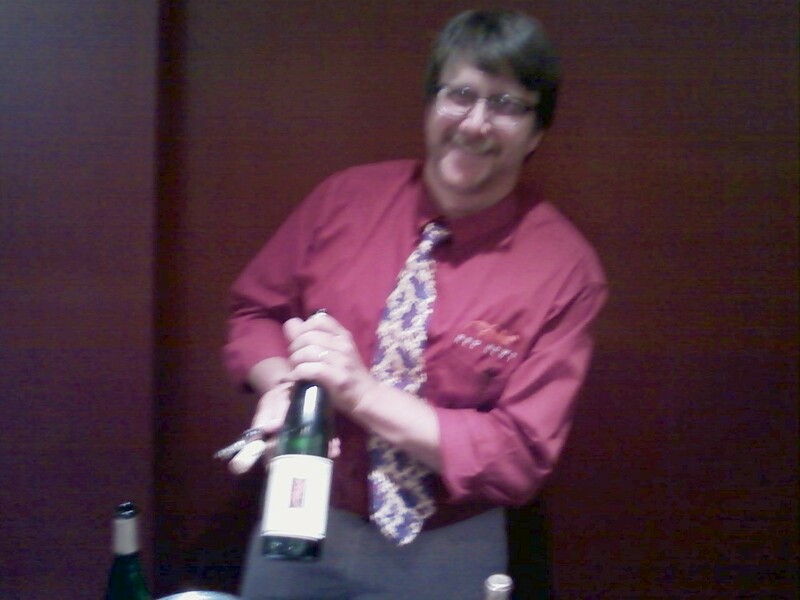 More than just meeting Oskar, I was thrilled to try some of his newest wines. On hand he poured his Riesling Dry 2009. It was a revelation. It smelled like a big fresh wedge of granny smith apple cut and placed in a glass. The wine was bright and light and refreshing. It danced on the tongue. I was so impressed, with the absolute elegance of the wine. An incredible display of winemaking technique. 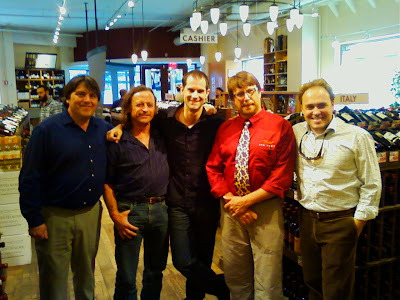 Last week three wonderful winemakers, a well regarded grower, and a highly acclaimed Finger Lakes author descended on New York City. At Union Square Wines Evan Dawson was signing his new book, celebrating the rise of Finger Lakes wine, Summer in a Glass. Evan is clearly on of the rising stars of wine writing and journalism. Pouring their wines as the signing were David Whiting of Red Newt, Oskar Bynke of Hermann J. Wiemer, Morten Hallgren of Ravines, and grower Sam Argetsinger of Argetsinger Vineyards. 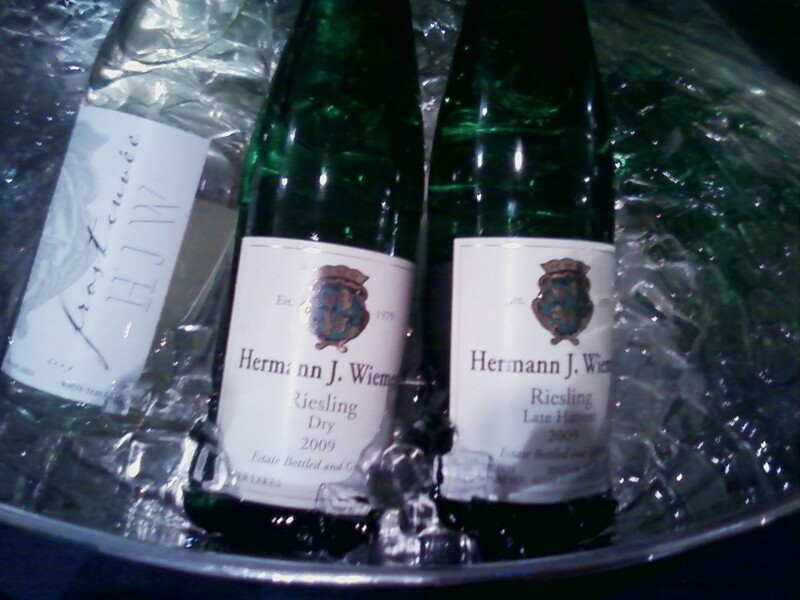 These are some of the best riesling makers in New York state. This was a momentous occasion, and in impressive display of winemaking prowess. 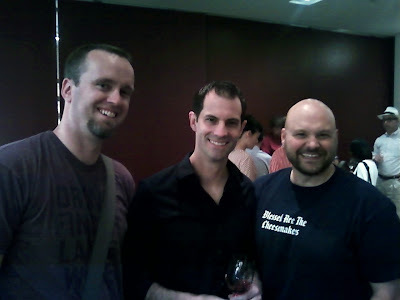 Also in atendance were LennThompson (Editor-in-Chief) and Aaron Estes (Cheese Editor) of the New York Cork Report, where Evan is managing editor. 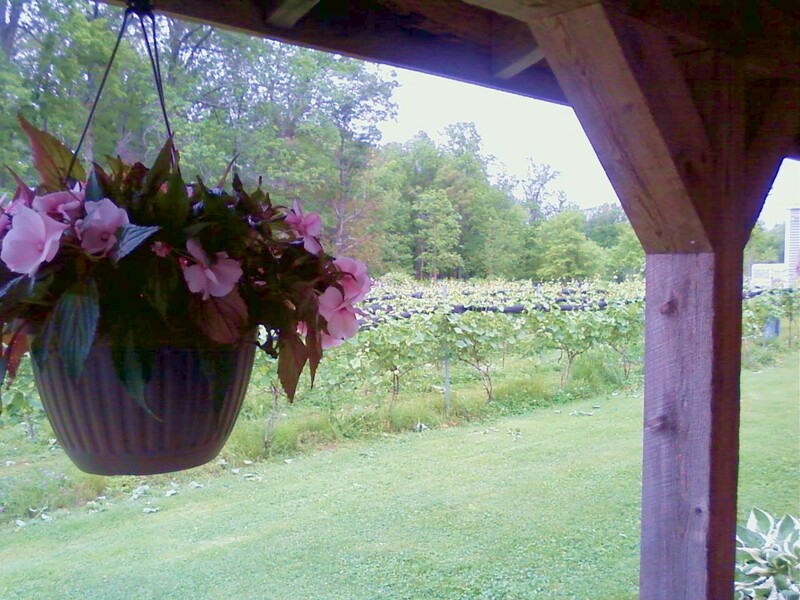 Sunset Meadow Vineyards is a family owned and operated vineyard located atop the Litchfield Hills. In Goshen, their vineyards overlook the picturesque sunsets and extravagant scenery of the beautiful Western Connecticut Highlands. Sunset Meadow Vineyards pride themselves on maintaining and operating the vineyards with tremendous precision. 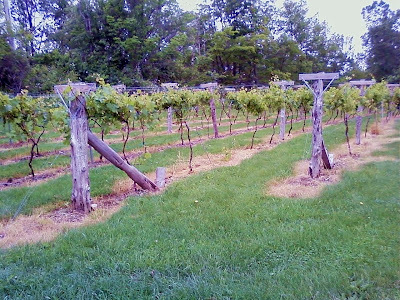 They maintain some of the largest vineyards in the state. The 21 acres of vineyards, with over 9,000 vines, are spread over 40 acres of gently sloping fields. 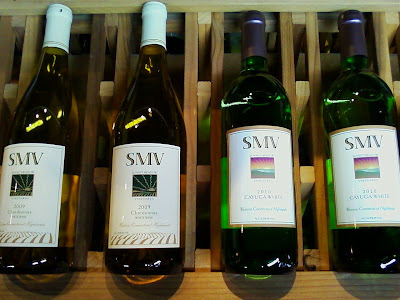 The first time I tasted the wines of Sunset Meadows Vineyards, I was at the Connecticut Wine Festival last year. I was more than surprised, especially by their reds. So I was eager to enter their driveway and taste some of their wines in their tasting room. First up was the Chardonnay grown in Connecticut. This white wine is a solid fruit forward up front. Green apple, melon, and hints of spice. The wine was aged in American oak and had a nice balance of minerality, and have a buttery and creamy finish. A really lovely chardonnay. The Dry Riesling was next. It was very floral, with hints of honeysuckle, green apple, and the flavor ended with a nice citrus touch. Very flavorful. The St. Croix was a big, dry red, aged 24 months in oak. A big, dry, smooth red wine with big whiffs of cherry, with hints of spice and pepper. This was a surprisingly wonderful, complex red, with lots of flavor and character. This was Dominique's favorite. The Twisted Red was next. This was a really interesting red. 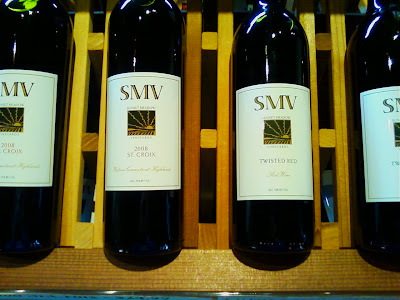 This is Sunset Meadow Vineyard's blend of Cabernet, Cabernet Franc, Lemberger and Chamborcin. This delicious, big full-bodied red wine is aged in French Oak. The wine has notes of Blackberry, Black Cherry and Plum, both on the nose and on the palate. This is a big, beautiful wine. Really nice. This is a big, full-bodied Merlot, aged on a combination of American and French Oaks. Big hints of cherry and hints of black pepper and spice. Nicely balanced. Very nice. Sunset Meadows is owned by UC Davis certified Enologist George Motel and his wife Judy. 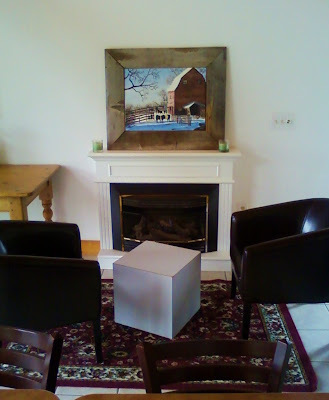 They created state-of-the-art production rooms in a restored 1890s German bank-barn tasting room and created a state of the art farm winery in Connecticut. And they've got a slew of medals from around the country to show that I'm not the only one who's enthusiastic about what they're doing. 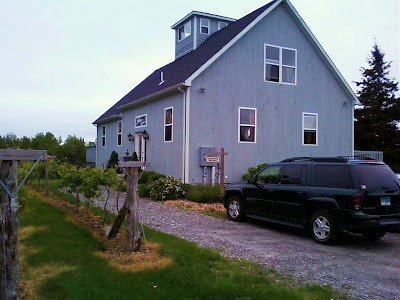 Go to Sunset Meadow in Goshen, CT, and see the rolling vineyards, and visit their tastingroom, and tell me you might not think you're in the Finger Lakes or on Long Island. It's a great time and great wine. 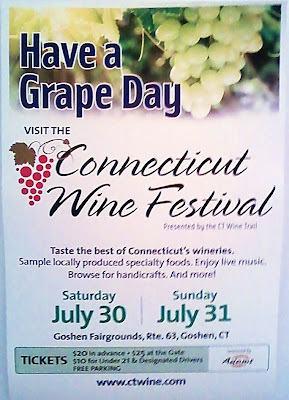 The Connecticut Wine Festival is July 30th and 31st at the Goshen Faigrounds, in Goshen, CT. Connecticut wines have really been on an up swing, and there's not better time to go and try them. 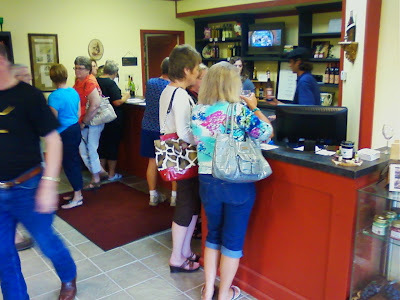 A great space, packed with wine, foo, and merriment. A lovely time is had by all. A lot of fun! 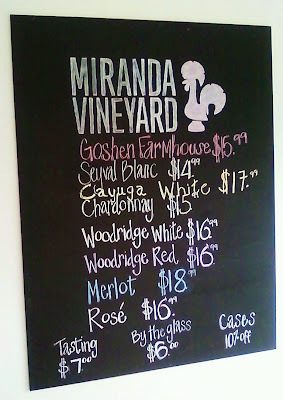 This is not the first time I have written about Miranda Winery. 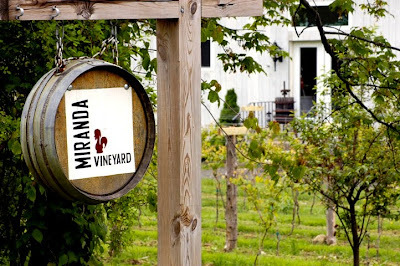 I discovered them back last year at the Connecticut Wine Festival where I fell in love with their Miranda Woodridge Red. But I recently decided to tour Connecticut a little more often and closely, and thought to stop in and see the place for myself. As has been told before, some sons learn how to fish from their fathers. Others learn how to play baseball. Manny Miranda learned how to make wine. Manny started making wine when he was a young kid. His yard was scattered with winemaking equipment watching and helping his father, and grandfather, make wine. Since he was a small boy growing up in Portugal, Manny dreamed of planting his own vineyard and building his own winery. It took more than 50 years, but he and Maria finally did it. Recently they both retired, Manny from his own construction company, Maria as a school principal. And now they’re doing the opposite of what many retired couples would do. They’re starting all over again. It's a remarkable story. So, we went in order. The Woodridge white was lovely. Bright, citrusy and well balanced. A versatile New England wine, blending chardonnay and seyval blanc grapes. Refreshing for a summer afternoon and elegant enough for an evening dinner party. Very, very lovely. Next we had the Seyval Blanc. This was a refreshing, light and fruity crisp white wine. It was a classic, crisp, fruity, and citrusy seyval blanc. Just gorgeous. 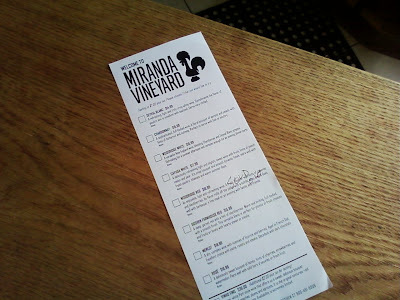 The Miranda Chardonnay was also very good. It was a elegant, full-bodied white wine. A floral bouquet of apricot and peach came through as promised. Some spice on the end as well. Very, very nice. The Rose' was also very lovely. HInts of strawberry on the nose. A hint of bright cherries as well. Great as a sipper or with cheese. Unfortunately, the Woodridge Red wasn't available. But we bought a few bottles of some of the other wines, not to worry. A lovely winery and some great wines. A fun place to stop! I'm in Florida on business. While visiting the grocery store Publix, very popular chain in Florida, where I stopped to buy tooth paste and mouthwash. And there in the aisle was a display for local wine. Keel and Curley Winery. Keel and Curley Winery was started in spring of 2003 in the kitchen of founder and owner, Joe Keel. Keel, a central Florida blueberry farmer wanted to find something to do with his end of crop blueberries. As in most produce farming, once the market price reaches a price which is lower than harvest and sale commissions, farms stop harvesting their crops. At this time in the season, there are still a lot of quality blueberries on the bushes. So Keel asked himself, “what can I do with this perfectly good fruit, to use it in a productive way and not waste it? Jellies, jams, blueberry pies? 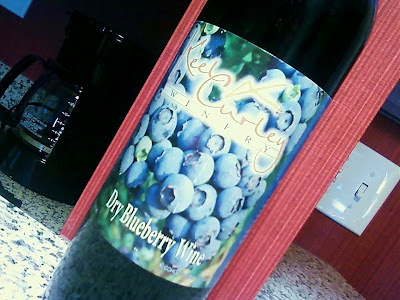 No!” Keel decided blueberry wine would be interesting to dabble with in the family farm house kitchen. He started that spring of 2003 with 10 gallons of blueberry wine. The wine came out so-so, but drinkable. So he made 10 more gallons and it got better each time. So was the beginning of a company he started with production of over 20,000 cases of quality wines that the company produces to this day. Fusion wines are wines that are fused, or blended wines. 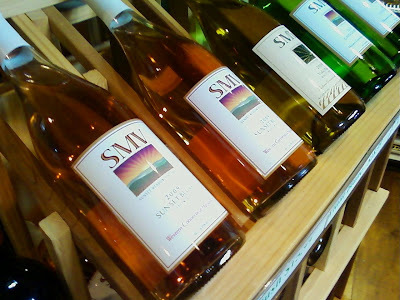 Part grape based wines, (for example, Merlot or Chardonnay) blended with fruit juices (Strawberry or Tangerine). Keel and Curley winery produces seven (7) different Fusion wines, great for picnics, summer sipping, and perfect for barbecue, Mexican, or other spicey summer fare. 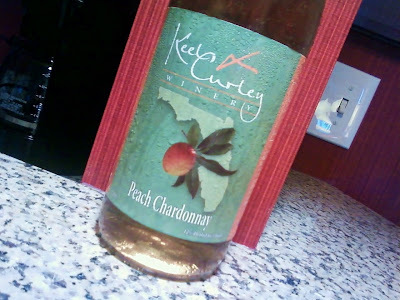 I bought a bottle each of Keel and Curley Peach Chardonnay and Dry Blueberry Wine. The Dry Blueberry is 100% blueberries, no grapes added. Purple-red coloring with the tart scent of sweet berry skin. The body is big and brash. Now, I am a fan of dry blueberry wine, as you well know from my writings on Bartlett. Now, where Bartlett's dry wild blueberry tastes more like a fine Chianti, I think, like Dave McIntyre, that Keel & Curley's wine tastes much more like a fruity malbec. Big nose. Nice color. Medium finish. Nice with BBQ or pizza. The Peach Chardonnay is light golden in coloring with a bright note of peach blossom on the nose. The body is crisp and rounded, sweetly scented of ripe orchard peaches> And maybe a hint of light honey as promised. Not too sweet, not too dry and bursting with fruit flavor. Would be great with BBQ and Mexican as well. A super summer sipped. A fun picnic wine. Cape May Winery first made it's reputation before it even had a tastingroom. 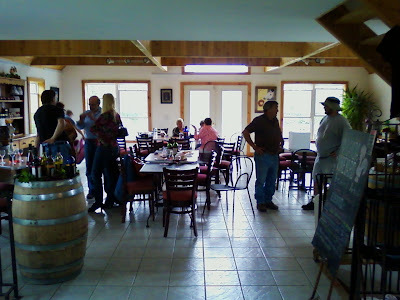 It was a small production winery, and the only way you could taste the wine was to have lunch or dinner in seven or ten restaurants in Cape May and drink the Cape May Blush, which was an instant hit! 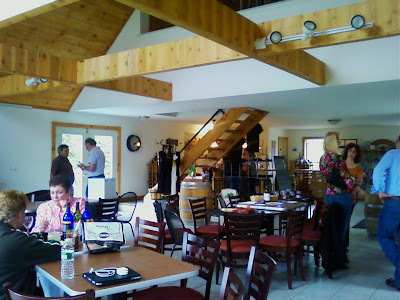 In the intervening years, Cape May winery has exploded into one of the most dynamic wineries in New Jersey. The make classic vinifera, some picinic wines, and some dynamite ports. 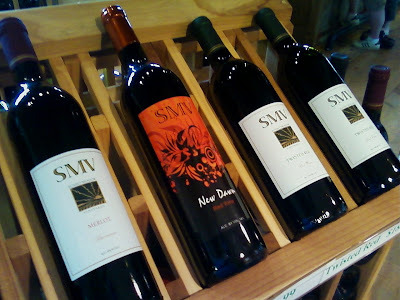 They have an inexpensive brand of wines, their Cape May grown wines, and their estate wines. Originally I liked their whites, which were crisp, clean, and refreshing. Some very nice whites. And the ports were great too! But I have to say that their reds grew on me. But I bought several bottles of the merlot 2004, which when I first tasted it some time ago, in either my 2005 or my 2006 visit. It instantly became a favorite of mine. Toby Craig, the owner, made a bold move, when he hired his winemaker. 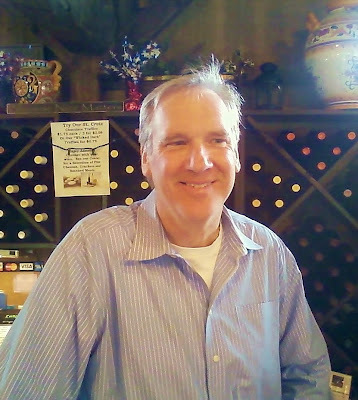 Darren Hesington, who perfected his winemaking under Australian winemaker Keith Brown, first made a name and reputation for himself at Unionville Vineyards, where he made an excellent array of wines. 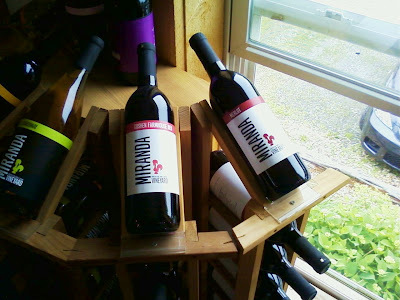 Hesington had firmly established Unionville at the top of the New Jersey wine pyramid. 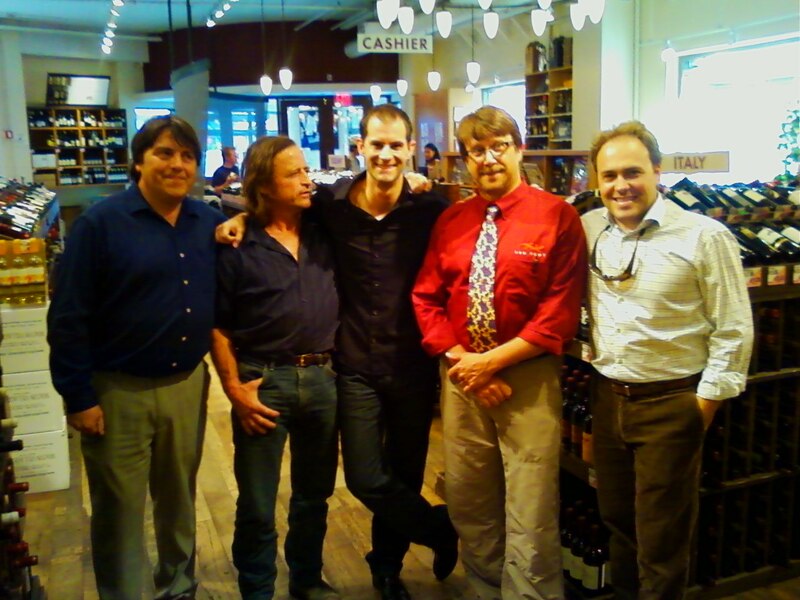 His arrival at Cape May was a watershed moment for the small winery. The wines have increasingly become better and better. They are now competitive with others in the state and the east coast. While roasting chicken, we decided, after tasting a lovely old white wine from another vineyard earlier in the evening, to open a red and press our luck. The winner hands down on choice was the Cape May Winery 2004 Merlot. We were well rewarded for our faith. The wine had aged beautifully. Still pregnant with a nose full of raspberry, cherry, and hints of cedar and vanilla, the palate was awash in stewed dark fruits like dark cherries, dark raspberries, and a hint of cassis, and just a whisp of saddle leather or fall autumn forrest floor. Just a slight hint. The tannins were still solid, and the acids were really well balanced. A terrific wine! 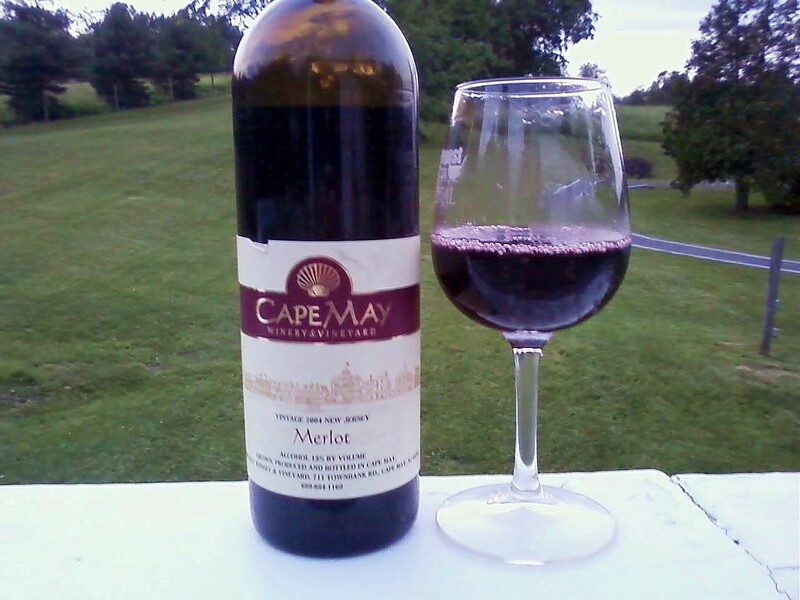 Congrats to Toby and Darren and the rest of the staff at Cape May Winery! 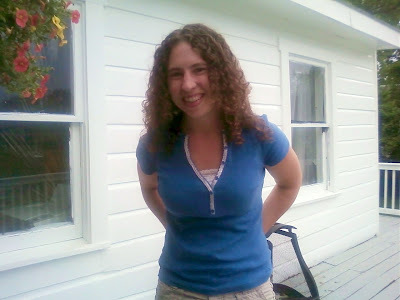 A week or so ago we were visited by Julia Burke, the beer editor from the New York Cork Report. 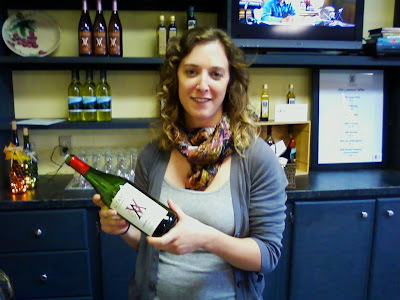 She came to taste Chatham Brewing and did a little tour of the Hudson Valley wineries with David Jackson. Of course, we invited for a tasting at the winery. After talking, we decided to go down into the wine cellar and let her pick a bottle or two for more tasting.I took her down to our cellar (the basement) and let her look through it all herself. I am one of those wierd people that cellar beer. I like new fresh beers, but I also love big bottle beers that have some age on 'em. Call me a freak. 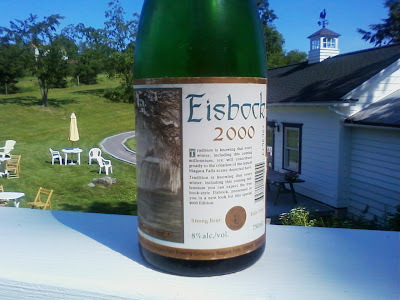 While perusing my cellar, she happened upon a bottle of 2000 Eisbock from the Niagara Brewing Company. Niagara Falls Brewing was a medium-sized independent Canadian brewery. It is now a label owned by Moosehead, that purchased the company, and then moved in 2007 to Brampton, Ontario. According to Bar Towel.com, "Niagara Falls was daring, and their beers reflected this attitude. The beers were experimental, and gave Ontario beer connoisseurs a rare and appreciated gift. With the exception of the Maple Wheat, Kriek and Brock's Extra Stout, the rest of the 1995-1996 slate is still produced, and the surviving beers should be celebrated. "When the brewery opened in 1989, it produced Eisbock, a now-legendary brew. Niagara Falls was the first brewery in North America to produce an eisbock, a potent German-style bock beer. The brew is frozen during the brewing process, and the ice is removed (which is just water, as water freezes before alcohol). The resulting brew is of extra-strength, with enhanced character and complexity. The Eisbock is produced once a year, and a new label is created for each vintage. An extra-concentrated version, Eisbock Gold, was discontinued. But the original Eisbock, although losing some of its complexity during the last few vintages, is a worthwhile brew to seek out each year. "The remaining Niagara Falls beers from the 1995-1996 slate remain some of the most unique in the province. Olde Jack is billed a strong bitter, but invokes tastes of Belgian and British ales. The Apple Ale is an apple-flavoured brew, and most definitely a beer and not a cider. And both the Saaz Pilsner and Gritstone Premium Ale are tasty, rich and distinctive. To round out the lineup, Niagara also produces Premium Lager and Premium Light. 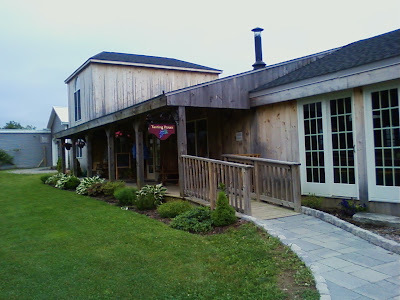 Niagara Falls Brewing was eventually bought by Moosehead, and was moved in 2007 to Brampton, Ontario. But their Eisbock was legendary. So, with complete excitment, we placed the beer in the fridge, let it get slightly colder, and then we opened the bottle. Me, Julia and David all took a sip, and our eyebrows jumped! The beer was incredible! It had all the complexity of a classic Eisbock. The liquid was dark golden almost brown, and slightly hazy, but not opaque. The suds were thick and full. The flavor was huge! Big, dusty malt, and the hops was still fresh. The finish was clean. The beer was awesome! Man, how can I find some more of this! A tremendous experience. A real nod to big bottle beers, and great brewing traditions. This is what makes craft beer exciting! OK, so I have been a fan of Sherwood House for many years. I've been drinking their wines since at least 2000 or 2001. And even at the fanciest dinner parties I have ever thrown, with the biggest wine snobs I know, I have always served Sherwood House as our chardonnay, and have never recieved anything but plaudits. Dr. and Barbara Smithen were North Fork, Long Island residents for over twenty years, and they finally found their dream home in 1996. The farmhouse, which was built in 1860, and the surrounding 38 acres of former corn and potato fields offered outstanding conditions for growing wine grapes. The Smithen's initially planted Chardonnay vines from Burgundian clones, after careful research and planning with vineyard manager Steve Mudd, have since added Merlot, Cabernet Sauvignon, Cabernet Franc, and Petit Verdot. Mudd is easilly the best vineyard man on the east coast - bar none! Gilles Martin is the winemaker. Award-winning winemaker Gilles Martin has directed the operations of more than two dozen wineries during his fifteen years of viniculture experience and has been the head winemaker at Sherwood House since it's inception. 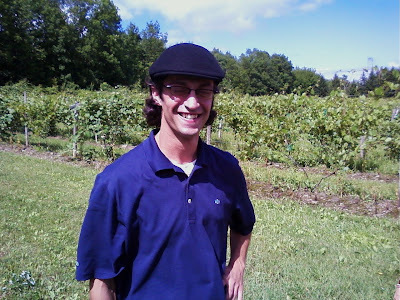 He is also the winemaker at Sparkling Point, and was the winemaker previously at Macari Vineyards. His reputation is impressive. It's important to note that the Smithens have worked with two of the best pros in the business out on Long Island, in Mudd and Martin, which shows their commitment to aking exceptional wine. Which brings me to my story. 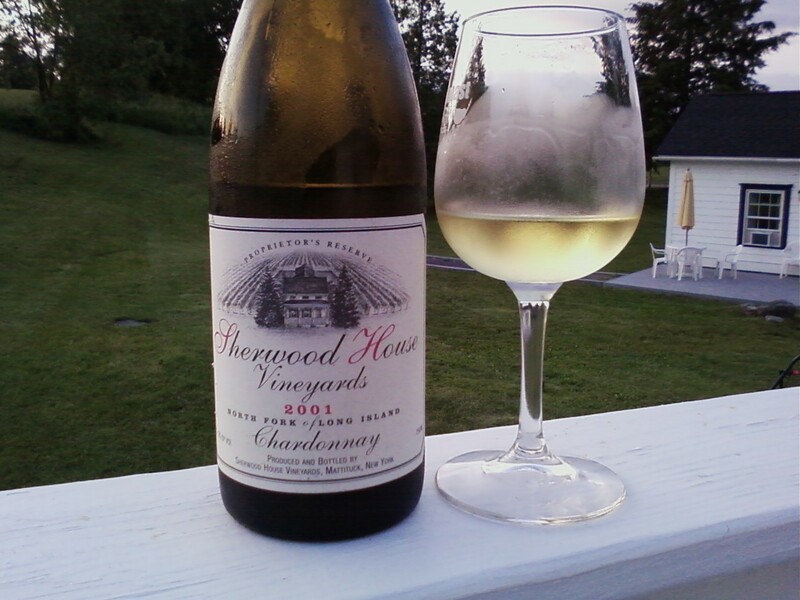 Searching through the cellar the other day, I found a Sherwood House 2001 Chardonnay. My first thought was, "Damn, I let this go too long." But I decided to chill it and see what was left inside. Yesterday was a beautiful day in the Hudson Valley. Spectacular. I drove around the valley. It was stunning. We attended my son's band concert at the school - outside, a la' Tanglewod, and then came home to grill chicken and determined to open the Sherwood House. The snap, crackle and sizzle of the chicken, and it's wonderful aromas (rubbed with sea salt, freshly cracked pepper, and other spices) filled the air. I opened the chilled bottle with trepidation, sure the wine might be oxidized and lost by now. Instead, a light golden elixor spilled forth from the bottle. Now, one of the things I have to say, yet again in a Sherwood House review, is that I do not like oaky chardonnays. And the Smithens and Martin are dedicated to making a rich, buttery chardonnay in the best Burgundian tradition. But the Sherwood House chards seem to completely transcend the awful, heavy bodied, too sweet, oaky chards of California (save Kistler, Pahlmeyer, Hanzell, and Patz & Hall). Sherwood's bright, acidic fruit, and Martin's light touch produce an incredible wine. The color is a light golden wine, with aroma's of green apple, melon, and a hint of lemon, all washing with the light scent of vanilla. The fruit explodes in your mouth, with a fresh green apple and it's wonderful acidity, but also with hints of honeydew and lemon. But the bite is never too harsh, as the wine has a slightlycreamy texture with an incredible finish. This was a ten year old wine! It wa like I had just opened it brand new! Now I was pissed all over again! This could have stayed in the bottle another five years! Where was I going to get another 10 year old bottle of Sherwood House? This was an incredible wine. Truly one of the best chardonnays I have ever had - bar none - take on all comers, California and France! A fabulous wine! Now, I've got to go buy more bottles and stock up my depleted store of Sherwood House Chardonnay! Congrats to Steve, Gilles, and the Smithens! Fantastic! 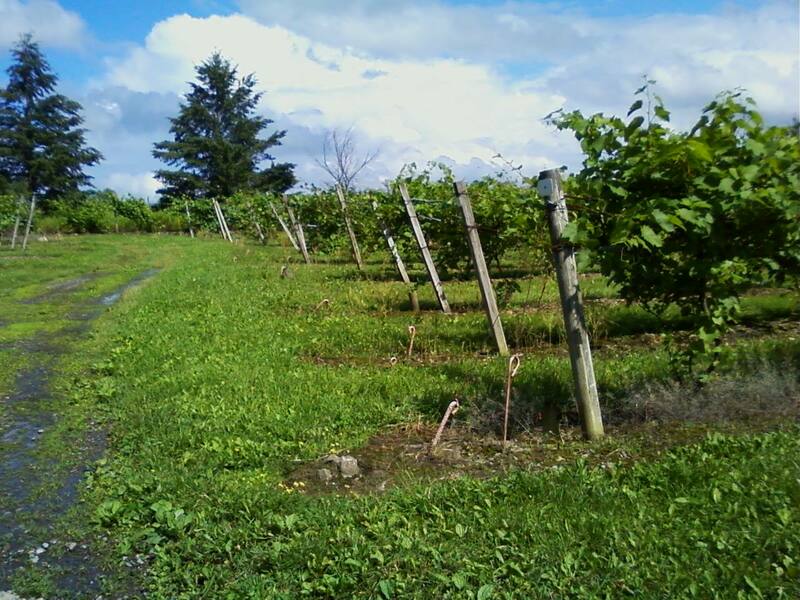 Is a Finger Lakes riesling style arising?